The Annette Brodovsky Memorial Benefit Concert will take place on Sunday, February 10, 2008, 3pm-5pm, in the sanctuary of Congregation Bet Haverim /Jewish Fellowship of Davis, 1715 Anderson Road, Davis, CA 95616. The all-klezmer program features (in order of appearance) The Davis Klezmer Orchestra, The Freilachmakers Old-Time String Band, and The Red-Hot Chachkas. The suggested ticket donation price is $20. 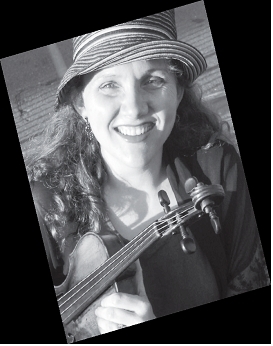 Annette (Liora) Brodovsky, just 33 years old, was a talented klezmer violinist, composer, Sacramento violin teacher and teacher of Jewish tradition, as well as a devoted wife and mother of two young daughters. Annette was tragically killed by a drunk driver, April 2, 2007, just before the beginning of Passover. Kind, totally selfless, and generous beyond measure, her angelic persona and enthusiasm graced anyone lucky enough to have met her and interacted with her. When Annette won the "Composer's Award" for an original piece of klezmer music she performed at KlezCalifornia in 2004, she immediately donated the prize money back to KlezCalifornia. Her passion for klezmer music -- and all music -- was something she shared with us all, young and old. Now, three Northern California klezmer bands are offering their music to benefit Annette’s family. Please join us in this unique opportunity to honor her memory and help those closest to her. All proceeds from this concert will benefit the family of Annette Brodovsky. All musicians are donating their music and labor. Congregation Bet Haverim, a sponsor, is donating the venue and their work for the concert. Organizers are asking for community members to become sponsors of the benefit concert. All donations are tax deductible. Sponsorships are available at the $50, $100, $500, $1000, and $2,500 levels. Checks should be made payable to Congregation Bet Haverim with a notation on the check that the donation is for the Annette Brodovsky fund. Please mail your sponsorship checks to Congregation Bet Haverim, 1715 Anderson Road, Davis, CA 95616, Attn: Annette Brodovsky Fund. For more information on sponsorship and the concert, please contact Elaine Fingerett at 530-756-7474. The Davis Klezmer Orchestra has been getting the Davis community to kick up its heels at weddings, bar and bat mitzvahs, anniversaries, and other joyous occasions since the early 90’s. Founded by Bob Wren, string-player extraordinaire, the ensemble began by playing music collected by ethnomusicologist Moishe Beregovsky. When Davis adopted Uman as a sister city in the Ukraine, Wren was inspired to give a Davis Art Center course in klezmer music. (Uman had been a capital of klezmer music and Jewish culture before the holocaust.) Three of the current band members were in that early 1992 class. When the course ended, the musicians just couldn’t stop. Today, band members include George Weis, cello; Julie Partansky, coronet; Ralph Libet, violin; Moreen Libet, viola; and Elaine Fingerett, accordion. Frequently the band is joined by Marc Epstein, clarinet; and Matt Herman, percussion. The Freilachmakers Klezmer String Band, 5-piece ensemble from Sacramento, California, has been entertaining enthusiastic audiences since 1995. The band's founding impetus was to create a Celtic and old-timey influenced version of klezmer that hearkened to the stringed instrument based origins of the genre. This approach, which relied particularly on the use of the fidl, bass and clawhammer banjo (in place of the tsimbl), was particularly well represented in their first CD, "The Flower of Berezin" (1998). Since that time they have been joined by a wonderful clarinetist, which has greatly enhanced their power and appeal. In the words of one reviewer, the Freilachmakers' music "bubbles with exuberance and a great sense of fun", their playing "highly viruostic, yet subtle". The band is available for concerts, weddings, bar/bat mitzvehs, conferences, fundraisers and other simchas. Band personnel include Andy Rubin (clawhammer banjo, mandolin, guitar and vocals), Marc Epstein (clarinet), Elaine Fingerett(accordion), Dave Rosenfeld (violin, guitar, mandolin, and percussion) and Lou Ann Weiss (string bass and cello.) Annette Brodovsky was the Freilachmakers’ fiddler between 2000 and 2005. The Red Hot Chachkas are two time winner of "Best Klezmer Band" in the Bay Area, 2006 and 2007, and featured on "Spark," a documentary show on KQED about klezmer music in the Bay Area. The Red Hot Chachkas' sound swings, shakes, and serenades. Comprised of multi-talented performers on violin, clarinet, mandolin, accordion, bass, and drums, the group plays traditional Eastern European dance tunes, ranging from frenzied to tranquil tantsn, plus original compositions and improvisions building on the klezmer tradition. Led since 1997 by Julie Egger, whose violin playing is inspiring, emotional, and contagious, they have performed at concerts, festivals, senior centers, schools, Jewish congregations, art and cultural exhibits, and private parties and simchas in the San Francisco Bay Area, where their versatility has excited, entertained and educated audiences young and old. The band’s latest CD is Spice it Up! Band members include Julie Egger, violin; Tony Phillips, mandolin; Barbara Speed, clarinet; Michael Arrow, drums; Breck Diebel, bass; and Glenn Hartman, accordion and piano.